Official artwork of a Moon Shard. Collecting all five forms a Power Moon. Moon Shards (also called moon fragments) are collectibles that first appear in Super Mario Odyssey. They are very similar to Silver Stars from Super Mario 64 DS, Super Mario Galaxy, and Super Mario Galaxy 2 in that Mario must collect five of them in total in order to make a Power Moon appear. Unlike Silver Stars, if Mario dies, he retains his Moon Shards. The total number of Moon Shards that Mario has collected can be seen at the top of the screen, similar to how Star Chips work in Super Mario Galaxy and Super Mario Galaxy 2. 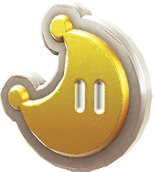 Unlike the Power Moons themselves, they are the same color in every kingdom, being golden with a white border. Cloud Kingdom 08: King of the Cube! Seaside Kingdom 30: Moon Shards in the Sea, 70: The Spinning Maze: Search! This page was last edited on March 29, 2019, at 06:48.